Due to the success of the first volume, Steve Pinkham now offers a new collection of stories! 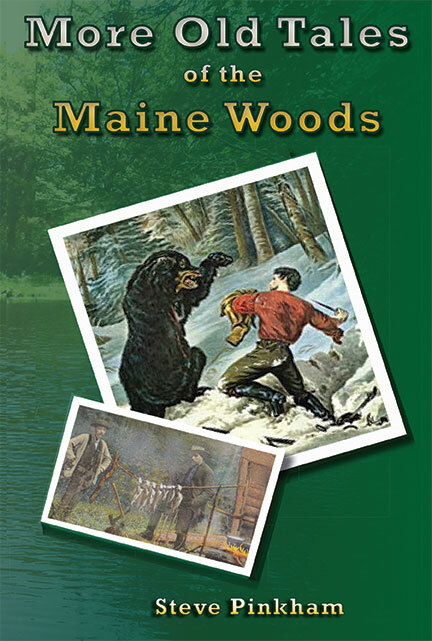 From his phenomenal collection of over 25,000 articles and stories of the Maine Woods, Steve Pinkham has selected more of the most exciting old hunting and fishing tales, as well as stories of animal encounters, lumbering, canoe trips and tall tales for this sequel to Old Tales of the Maine Woods. Ranging from 1845 to 1905, this book also covers the Maine Woods from Magalloway to Moosehead and Mopang to Madawaska. Most people know that Thoreau went to Maine several times, wrote eloquently about his travels and coined the phrase “Maine Woods.” Now for the reader will get to read more stories by many more known and unknown men and women who also travelled to northern Maine and wrote about their experiences of penned fictional stories set in the backwoods. Included are brief biographies and portraits of the known writers. For the unknown authors, Pinkham has included appropriate pictures. In his first volume, Pinkham included histories of each region; for this volume he has included many early bits of fascinating information for each chapter.